MoM project at Didacta Italia 2017. 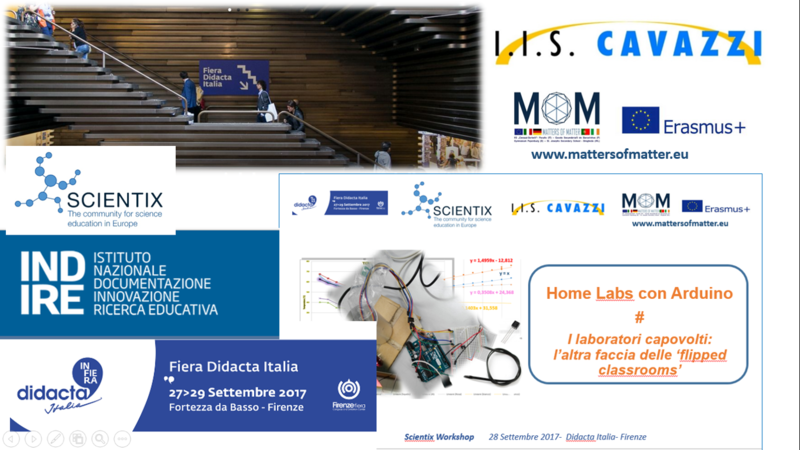 In the context of the taechers seminar organized by Scientix and Indire, one of the activities developed within MoM project was presented in a 1 hour hands-on workshop: Home labs &flipped Physics with Arduino and low cost sensors. Scientix is the European platform for Science teachers (http://www.scientix.eu/). Together with professional development for teachers and a huge archive of all Science education projects completed so far , both european and national (but all supported by public fun) Scientix is first of all a teachers’ community operating also through its ambassadors who are committed to the project disseminationa and to Science education innovation in general. MoM overnational coordinators is one of them.